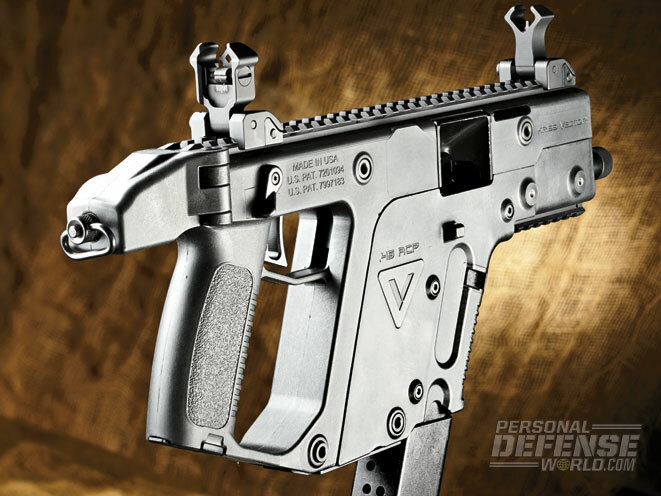 It's unorthodox, but this pistol is perfect for homestead defense or shooting at the range! 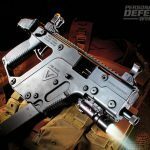 The Kriss Vector SDP is obviously not for everyday carry unless you’re working a VIP security detail. 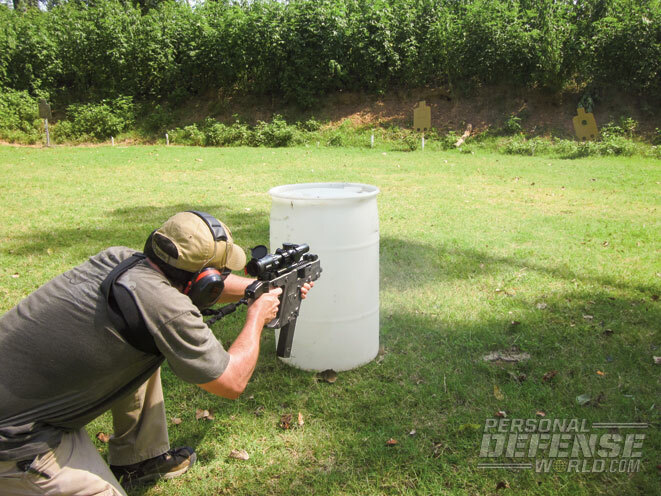 But for homestead defense or enjoyable shooting at the range, it’s tough to beat. 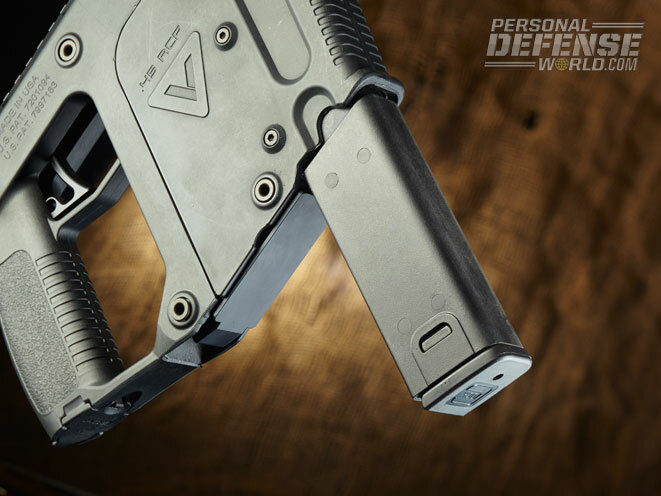 The safety switch is ambidextrous and sits directly above the pistol grip. 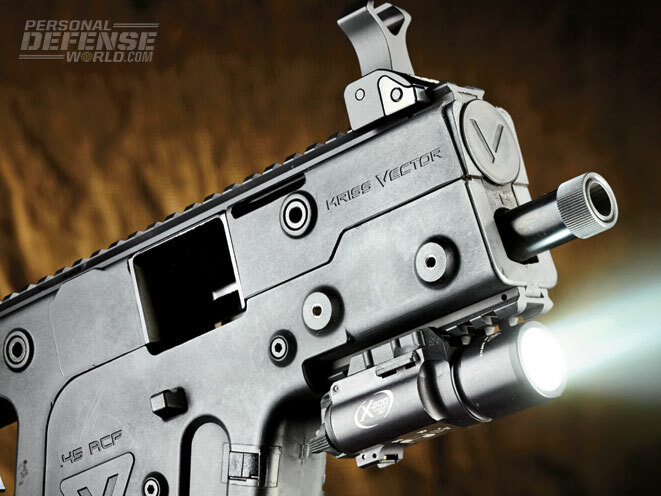 A recess above the barrel is designed for a Surefire Executive light, but the Picatinny rail positioned below the barrel can also be used to mount a laser or light. 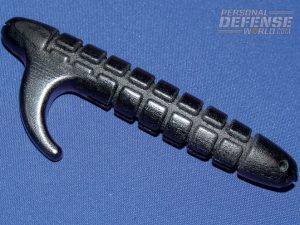 The supplied single-point sling allows shooters to further steady the gun. Accuracy at 25 yards was fantastic. I am one of those people who loves to see gun manufacturers that break the mold and come up with something different. I have lots of buddies who scoff at any non-traditional pistol, rifle or shotgun, and dismiss it without a second thought. What they don’t realize is that some of our greatest legacy firearms were so unique that they were laughed at when they were introduced. Eugene Stoner’s AR rifle had plastic furniture when the world was used to seeing wood. Gaston Glock’s G17 was called “tactical Tupperware” and scoffed at by legions. Everyone wants a better mousetrap, but many don’t recognize it when it shows up on their doorstep. 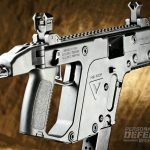 Founded in 2003, KRISS has a cult following based on its products’ unique designs, durability and jaw-dropping performance, as well as a healthy following in Europe where pistol-caliber long arms still dominate. I own and have trained on a lot of subguns. 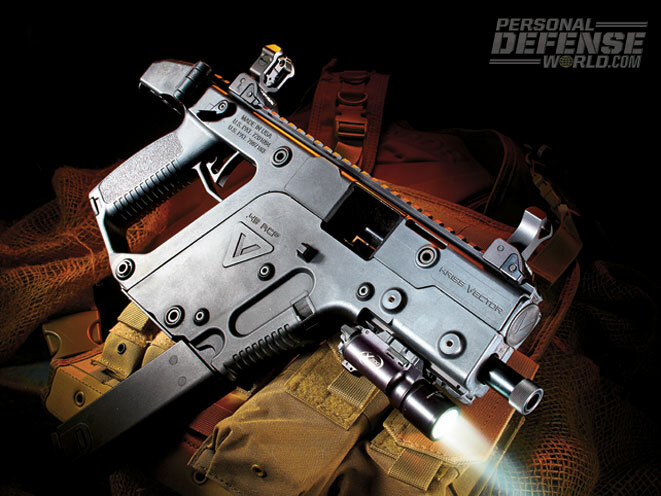 The KRISS remains my absolute favorite for full-auto fire. The muzzle simply does not rise, and keeping lead on target is almost too easy. 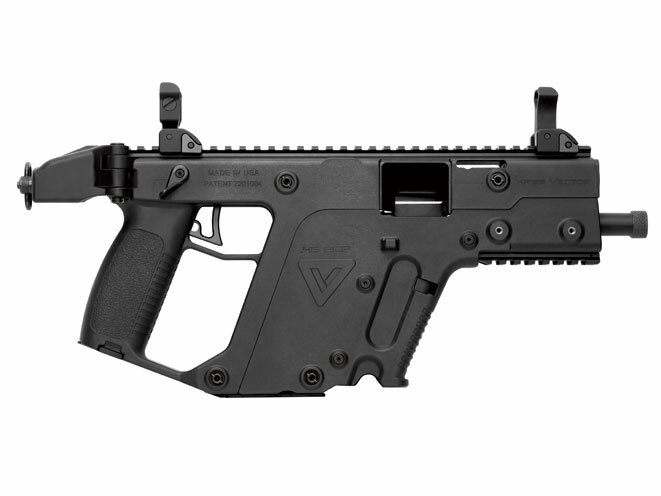 My test KRISS Vector Special Duty Pistol (SDP) arrived in a large, foam-lined, hard case (optional) along with a 13-round Glock .45 ACP magazine, a 25-round KRISS mag (optional), a single-point sling and a KRISS pen (optional) that doubles as a take-down tool. First impressions were that this gun is only a “pistol” in the legal definition according to ATF. 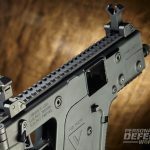 At 5.4 pounds, it weighs over three times as much as a Glock 21. However, the intended role of this firearm is completely different than your normal semi-automatic pistol. 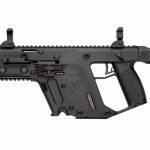 With the single-point sling worn diagonally and the KRISS SDP under my strong arm, it suddenly seemed a lot less bulky and heavy. In fact, a light jacket would go a long way to concealing it. And for VIP protection or a high-risk prisoner transport, this setup would be ideal. 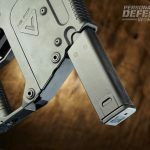 It could be brought on target faster than a gun from the holster, would be easier to aim and would allow for very fast follow-up shots due to the lack of muzzle rise. 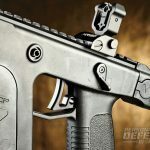 Almost nothing about the KRISS SDP is conventional, and it has a lot of features that are easy to overlook. 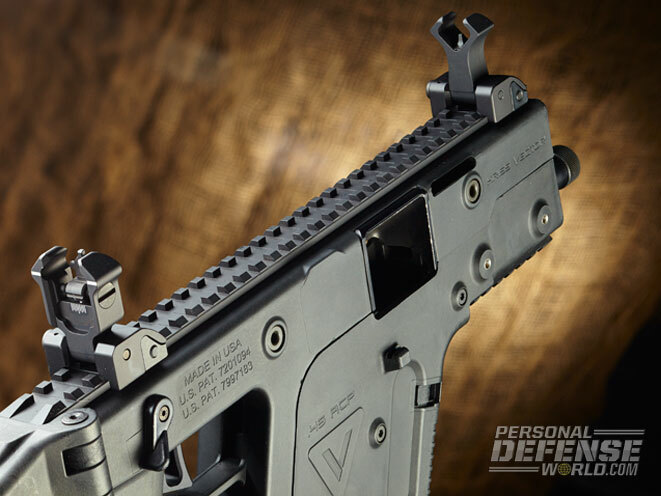 The non-reciprocating charging handle sits on the left side. Swiveling it out 90 degrees moves the bolt back approximately 0.25 inches and allows the shooter to see if there is a round in the chamber. It is the easiest gun to press check ever. Pulling the charging handle back farther to charge the weapon takes a lot more effort. The spring is heavy-duty. 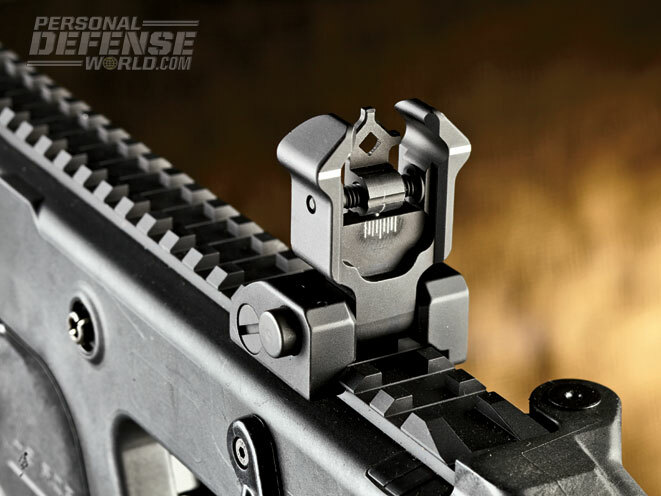 A bolt catch/release lever sits on the left side, just under the path of the charging handle. Directly under that, where the support hand rests, is the magazine-release button. A raised fence around the magazine release prevents shooters from accidentally pushing this button. I never hit it by accident, and once I got used to the location, I found it easy to drop magazines. A Picatinny rail runs under the barrel, and there are two threaded mounting points on either side of the receiver where additional accessory rail sections can be mounted. 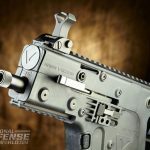 While the externals of the KRISS SDP are unique, the internals are downright revolutionary. Removing four identical take-down pins separates the lower and upper receivers. The upper receiver contains the hammer, which swings down to engage the firing pin. 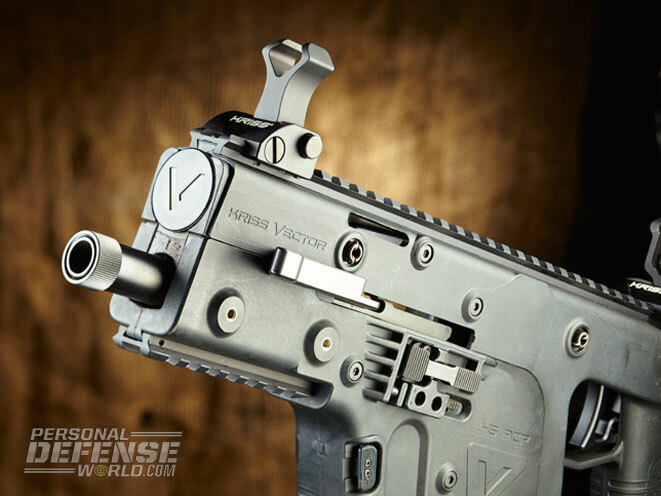 The lower receiver contains the heart of the KRISS Super V recoil reduction system. A weighted cam slides down instead of back with each shot. 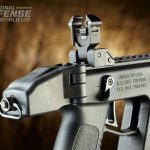 This simple but completely unique feature reduces felt recoil by as much as 65 percent and muzzle rise by an astounding 95 percent. I found disassembly and reassembly to be intuitive, quick and easy. The fact that the KRISS takes Glock .45 ACP magazines is a definite plus. They are not overly expensive, they have been around for decades and they represent the best in dependability and durability. Unfortunately, unlike the Glock “stick” magazines in 9mm, there are no super-high-capacity Glock factory .45 ACP magazines. KRISS simply built an extension that replaces the floorplate. It uses a longer spring, but the same mag follower. The springs proved to be pretty stiff and completely reliable, never causing a malfunction. I have never tested a pistol by attaching a bipod or mounting a scope designed for a carbine, but this time I did. An Atlas bipod and a Steiner 1-5×24 scope proved ideal for accuracy testing. The illuminated reticle in the scope proved equally useful for tactical drills later in the afternoon. 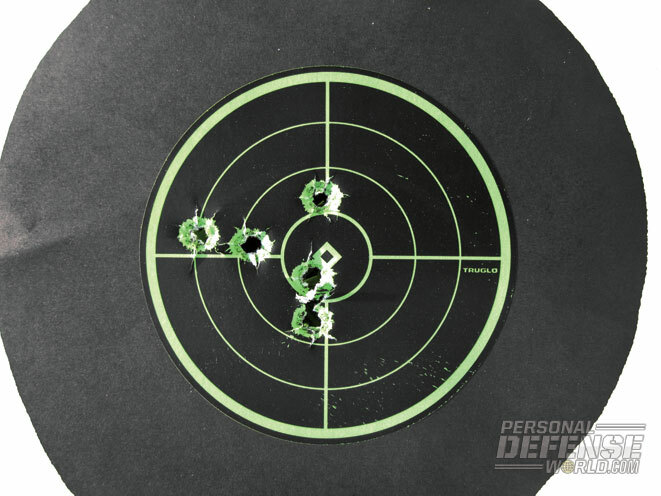 Despite its 8-pound trigger, accuracy at 25 yards was excellent. A fixed barrel and an excellent scope made it easier. My smallest group was 1.3 inches and my largest group was 2.5 inches. Tactical drills were far more interesting. 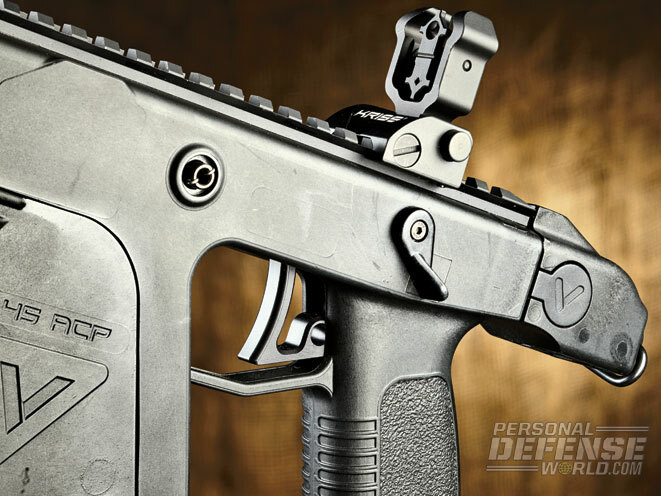 First, the KRISS SDP still has recoil, but it is not like any recoil you’ve ever felt before. 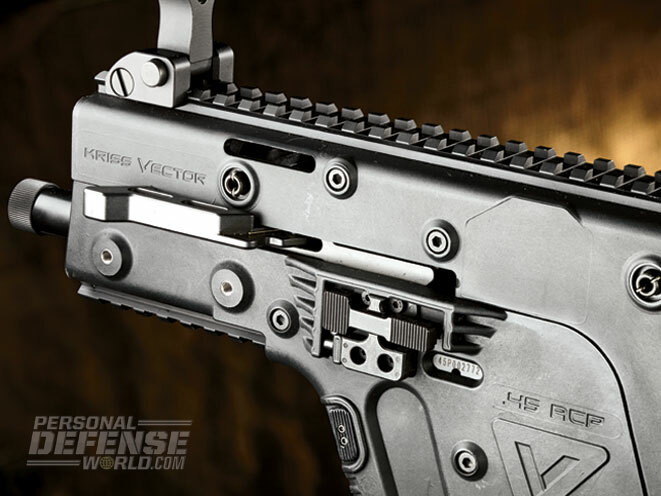 I guess the best way to describe it is that the blast of a .45 ACP going off makes the gun “shake.” However, with the low barrel bore axis, the KRISS Super V Vector system and the weight of the gun, you do not feel muzzle rise at all. It feels different than the recoil on any other gun. The gun is very controllable. I found a red-dot sight was far preferable to iron sights when doing any type of moving and shooting. Pushing forward on an attached sling helped to steady the weapon, but without a stock it was slow to line up the iron sights. 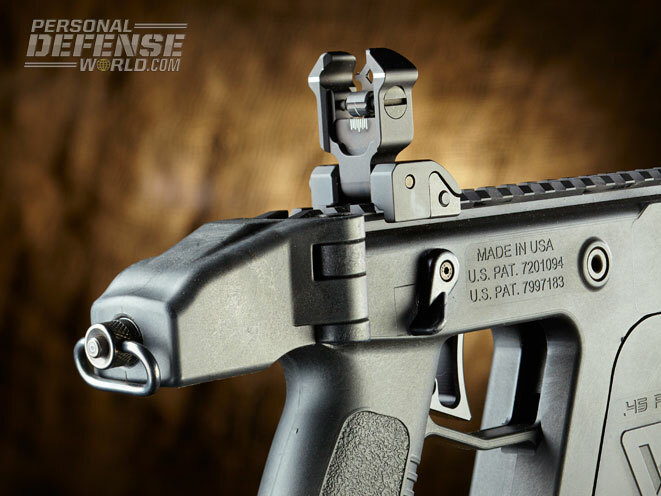 A red-dot sight proved much more forgiving and far quicker to acquire. I am not usually a fan of visible lasers on a gun, but this would be an exception. I think having a laser and being able to shoot from the hip would have been even faster. Shooting a pistol with two hands is old hat, but shooting one with my hands separated felt more like shooting a carbine than a pistol. The gun is still light enough that performing reloads up in the work zone and holding the SDP one handed was no problem. 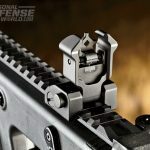 The 3.6-inch mechanical offset of the sights over the bore axis is especially significant when shooting in close quarters. 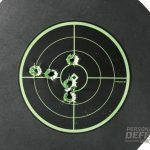 I used a 25-yard sight in, and inside of 7 yards it was important to remember that the bullet would impact a couple inches lower than where I was aiming. I heartily endorse subguns for a variety of different types of operations. I think their role needs to be re-examined by American law enforcement. 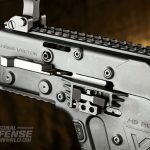 Here are a few reasons why: pistol-round lethality has improved dramatically over the last 10 years, subguns are far more controllable than carbines, hearing injuries to officers are far less with pistol rounds, and officers tend to become proficient in their use at a far quicker rate than when using carbines in rifle calibers. 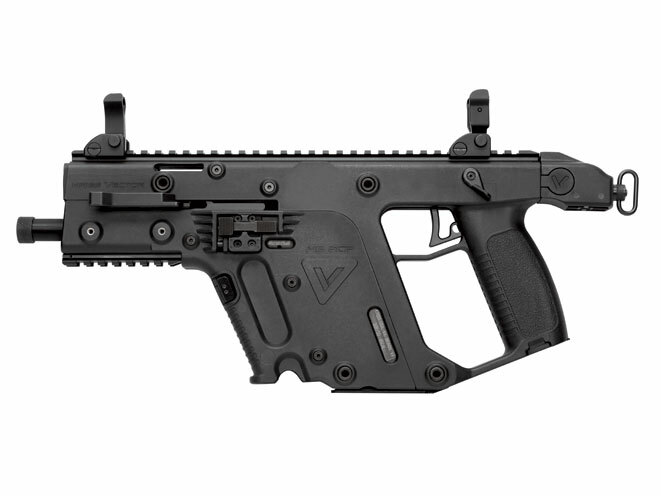 The KRISS Vector SDP .45 ACP pistol is not technically a subgun because it does not have a stock. 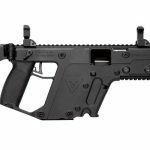 It has the advantage of being more concealable, yet offers fast, accurate rounds on target in an instant. 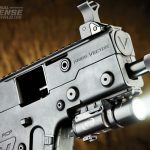 The unique characteristics of the KRISS SDP make it far more controllable under rapid fire than anything else I have ever tested. 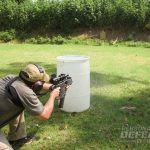 A look at various less-lethal self-defense tools for situations that call for different measures!